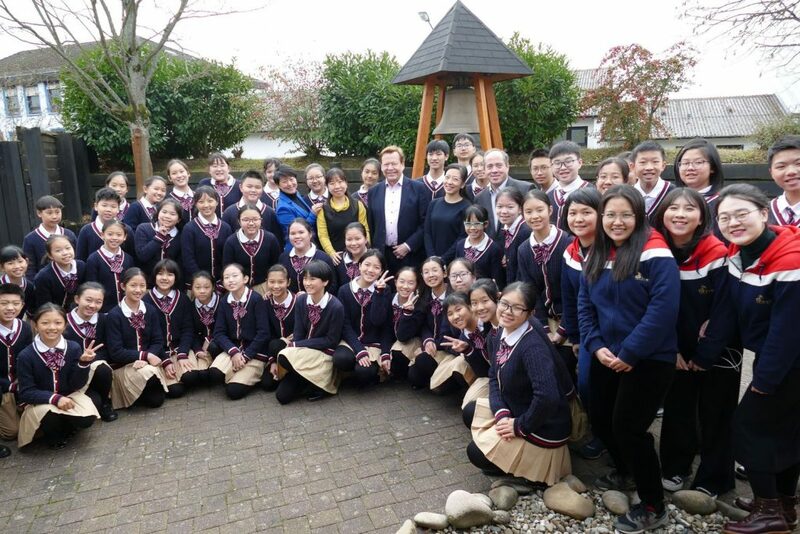 Surprise visit at the INTERKULTUR Organization Office in Fernwald, Germany: After its participation in the first International Choir Competition Maastricht (Netherlands) the Liwan Children’s Choir from Guangzhou and its conductor HuiKun Li and Zhanbi Zhang visited INTERKULTUR President Günter Titsch, the General Director INTERKULTUR China and First Vice President Wang Qin and their team on Tuesday, February 12. After a short welcome by Günter Titsch and Wang Qin the 50 singers sung serenaded to their hosts and afterwards admired the World Choir Games Peace Bell in front of the INTERKULTUR head office, where they insisted again on gathering and singing another piece from their repertoire before saying goodbye to everyone. The Liwan Children’s Choir, which won the category “Children’s Choir” at the Maastricht choir competition last week, has been on cordial terms with INTERKULTUR for quite some time. They achieved their first title at an INTERKULTUR event during the World Choir Games 2016 in Sochi, Russia, where they became Champion in the “Gospel” category. Following the International Choir Competition Maastricht the choir is travelling further European countries as an ambassador of Chinese culture and choral singing.